Yesterday, my sister-in-law and I canned tomatoes for the first time. 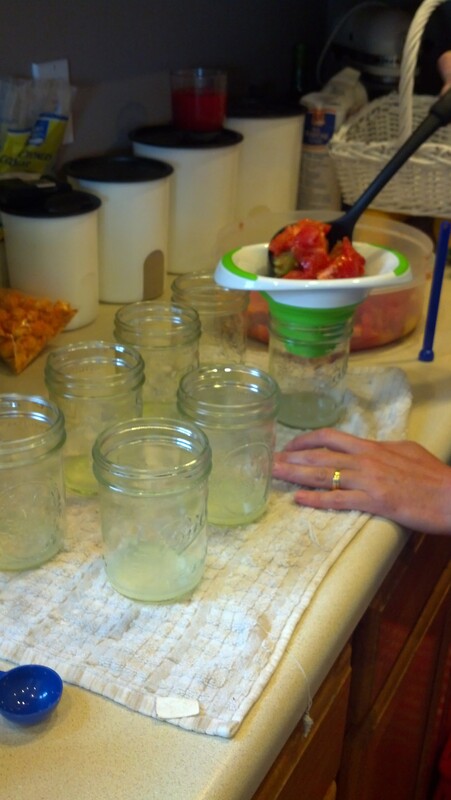 We used the recipe from the Ball Canning book for canning tomatoes in their own juice. We had a variety of tomatoes: Mr. Stripey, Black Prince, Roma and some heirloom red tomatoes from our CSA share. We ended up with two big bowls of diced tomatoes after we had blanched them. 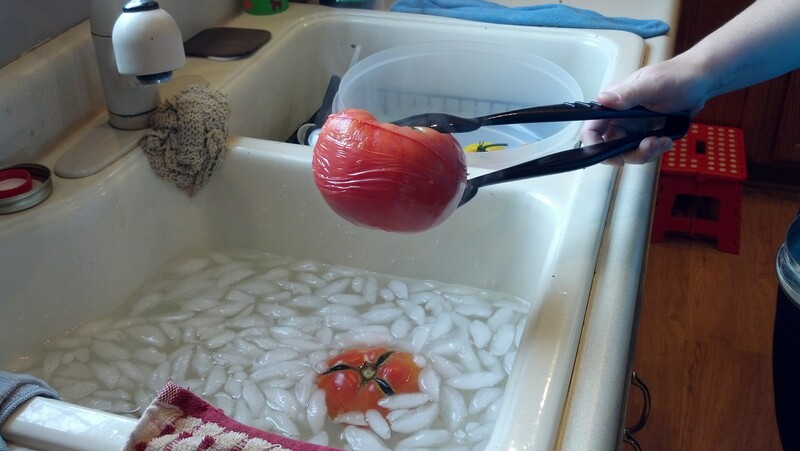 I was amazed at how easy it was to peel the skin off once the hot veggie was dunked in ice water. We started the whole process at 1:30 and had 7 jars in the water bath canner by 3. Then it was another two hours while the boiling water sealed the jars. 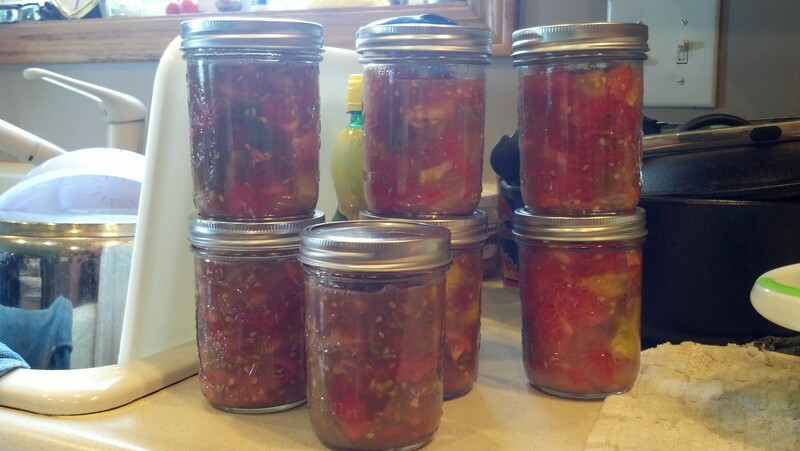 Seven jars fit in the canner, but I was sure we wouldn’t have enough tomatoes to fill all seven. Boy was I wrong. We had an entire bowl left over. I think the jars look pretty with their red, yellow and dark red tomatoes floating around in the juice. 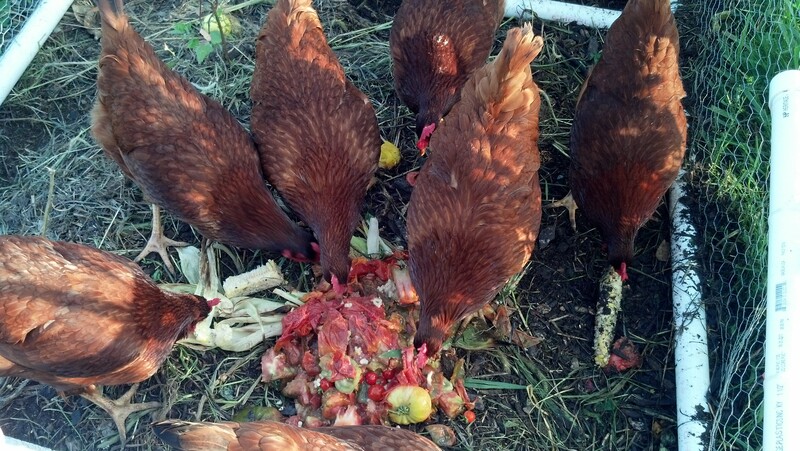 All of the tomato skins, seeds and cores went into the scrap bowl for the chickens. They were very happy with their evening snack. A few fights even broke out over the larger pieces. I’m a little skeptical about how these tomatoes will taste. Some of them were not quite ripe enough, so I just used the ripe part and cut off the rest for the chickens to enjoy. We have so many more tomatoes in the garden that are ripening every day. I think I’ll try my hand at sauce and salsa. This entry was posted in 13 Skills, Canning, Food, Garden Stories, Writing. Bookmark the permalink. The big heirloom tomatoes like that are $4.99/lb on sale at Whole Foods. But they are great topped with a little salt, olive oil, and balsamic vinegar, and a basil leaf. (And mozzeralla if you are into that). Isn’t that a caprese salad? Aunt Connie makes a dish like that and it is delicious! If there is ever a time that you really don’t have enough ripe tomatoes at once, core them and stick them in gallon bags in the freezer. And when you gather enough, take them & place in warm water & the skins will also slide off! So cool! Sweet! I froze my romas last year but didn’t core them first and didn’t even try to peel the skins off. I was attempting to can sauce but ended up freezing it instead. Thanks for the tip!